Faster than you can spell au revoir, I hurried down the jet-bridge with my seat assignment to Paris. This was my first 24 hour solo transatlantic adventure, traveling standby as an airline professional. What a perk, what an opportunity. The morning sun flickered through the windows as the Airbus touched down on foreign soil. Belly full from a pasta coma, muscles stiff from being cramped in flight in a shape only a sleepy traveler, or twizzlers could achieve. I pondered in the customs line: “Is this the city with the pointy tower, or the leaning one?” A stamp made a new home in my passport. I boarded a local train with with my rookie traveling suitcase, and laptop. 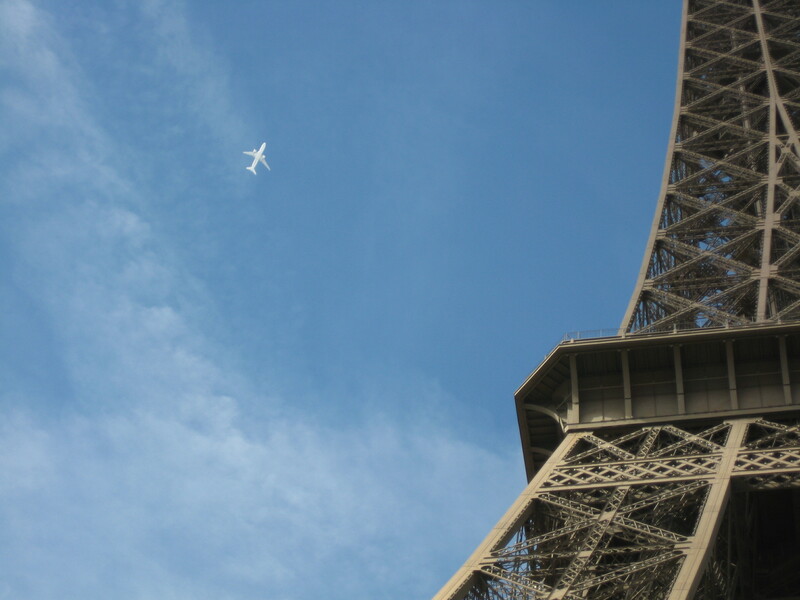 Cutting through the blue sky and puffy Parisian clouds, there she stood; Miss Eiffel herself. It was majestic, halting me in my tracks, over the River Seine. The freedom to explore and the brisk European air ignited me with energy. Sitting on the grass, I gazing up in awe as I savored my first authentic French crepe. I explored beautiful streets, and magical corners. Local fit Frenchmen with high fashion walked past. I breathed in their movie star cologne, as it trailed after them. Cats crossed cobblestone streets daintily, all was peaceful except me, the awkward newbie tourist bouncing my luggage over bumpy terrain. Cars sped along the Champs De Élysées. Parisian fare drew me into a window seat restaurant, along the promenade. My eyes fixed on the bustling movement of this famous city. I ordered myself an entire Margherita pizza. Fresh, cloud-like mozzarella chunks with local tomatoes. My sad attempt at French added to the strange looks I received as I quickly learned in Europe, don’t ask for a to-go box. The evening sky was darkening but I wanted to explore so I didn’t bother booking a room. I secured my leftovers under the flap of my laptop bag and moved on. Later my thought was to catch a safe nap in a warm theater, with a late night show. It was a tiny theatre, bathroom to the right of the screen, striking more of my curiosity than the actual film. Neighbors filled in seats surrounding me, none of us impressed with my baggage which increased my embarrassment as the tight area forced me to straddle my bags. I was horrified as the smell of pizza seeped into the theatre. I visualized it dripping out of the box, onto my laptop and down my neighbors leg. To top that classic awkwardness, the movie was a love story in English with French subtitles, what?! My intention was to nap and hit the streets renewed. Instead I found myself solo, cold, in Paris in a late night showing of heartache where tears, not dreams fought for my attention. Late into the Parisian night, I found a park bench, legs exhausted, right arm extended permanently backwards from lugging my bags in tow for hours on end. Following studying French maps, and transportation schedules I asked a local if this was the correct bus to take. He asked me in perfectly good English: “Do you know French?” I said: “No” he snickered and kept walking. It felt like someone had stabbed my little naive travel heart. It was the wake up call I needed to make an effort prior to visiting other countries, to learn basic phrases like toilet, thank you and cheers. It’s only right and smart to do so. A bit later in my sleepy stupor two men surrounded me on the park bench. Nothing like an adrenaline alarm clock. They invited me to a party near the airport, this party I had no desire being a guest at. They caught on I wasn’t interested but showed me where the train station was and said I didn’t need a ticket at that hour. When I exited at the airport stop, instantly I knew I had been scammed. You needed your ticket to exit the turnstiles, or you would forever live underground with rats as roomies. The barricades, coldness and guards made me a tad uneasy. I didn’t know how I would get beyond it without a ticket, in order to fly home. Perhaps locals were thinking: “another trapped tourist, pacing like a rooster.” I’ll leave the details to your imagination, but never was I so happy to enter a terminal. Hours later, I returned to work thinking about the lessons learned, outfitted in clothes that had explored Paris. I slid into my office chair, dirty, smiling, and sparked about what I had just pulled off, on my day off! You are my #1 fan!! Perhaps someday you can come along on an adventure with me! Thanks for your support and <3! I loved Paris…the sights, the sounds….the smells. Thanks for bringing me back! You went to Paris with out me and I didn’t know about it!!!!!!!! I said i want to go to London but Paris is awesome too!!!!! Birthday Volkl Chica, I would never go without you!! Paris was a few years ago 🙂 tell me when you can go to London!! Thanks so much for reading Bean’s Dream!